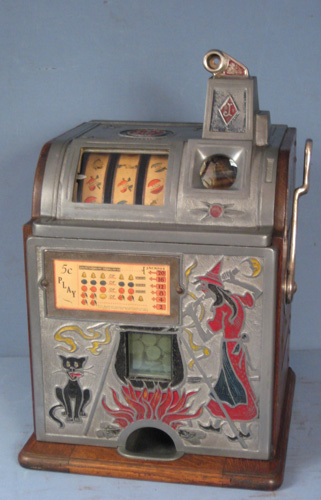 CoinOpCollectorForum.com • View topic - Mills Vest Pocket - 2 different machines? Mills Vest Pocket - 2 different machines? I have two vest pocket machines. One from my Dad and one I bought for parts. Interestingly, they have slight differences. Most notably, my dads machine has a corner notch and a counter that goes to 9. The other machine has no notch and no counter. Both payout doorsshow 20 and neither says “PLUS”. Re: Mills Vest Pocket - 2 different machines? What's the serial number on the one with the rounded corner? I'm guessing it's an early one. When I have a chance in the next few days, I'll post some pictures of the same end of a pair of VPs with serial numbers right around 42,000 - though one has a unnumbered mechanism that has to be a swap, because the mechanism is exactly like that with the counter, but what appears to be the original award card isn't for a Plus. Interestingly, the other one has the same notch, but doesn't have the screw holes for the counter matching bracket, making it not interchangeable, which surprises me. Oh, and does anyone who's reading this know if repro Plus award cards are available, or if not, who'd be most likely to have an original?